Every year, pediatric patients in mid-Missouri join our MizzouThon Family as our Miracle Kids. They can expect to receive year-round personal attention, support and friendship from our members. 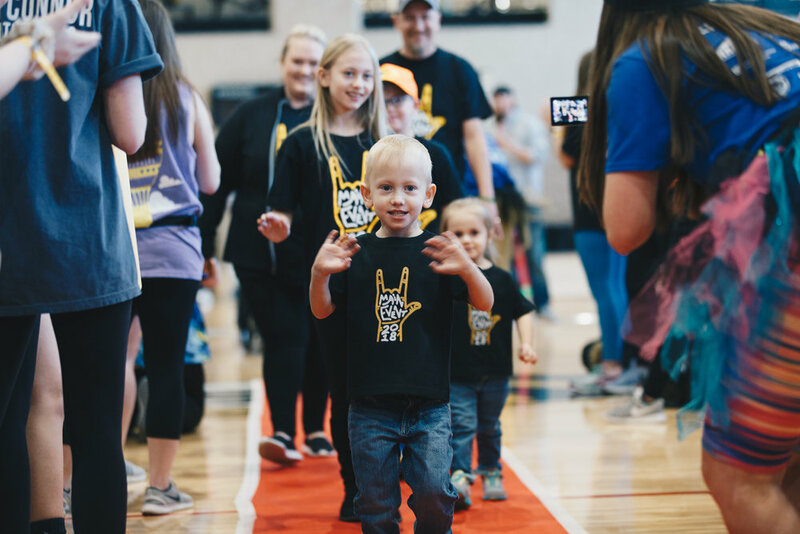 Our Miracle Kids are the sole reason why MizzouThon exists. Their strength, love and resilience are what drives this movement year after year. Taylor loves to listen to, sing and play music--especially if it is anything Alvin & the Chipmunks. He’s a social butterfly who enjoys to be praised and talked to. You’ll frequently catch him jamming on his tambourine or hanging with Marching Mizzou. Taylor’s favorite song is London Bridge, and he will often sing along with you! T.J is a fun, determined, kid that loves life. Born with a degenerative muscular condition, Duchenne Muscular Dystrophy, T.J. deals with a lot of challenges on a daily basis. Despite these challenges, he doesn't let them stop him from having fun fishing, swimming, and playing video games with his older brother. T.J. has a huge love for the military; he was even given the opportunity to become and honorary Missouri National Guardsman. Twin to Bryce, Beau is an energetic, hard-rocking kid who loves to play kickball, electric guitar, and sing. After a tough start to life as a micro preemie with multiple surgeries and complications, Beau bounced back and grew into the lively and lovable kid he is today. Twin to Beau, Bryce is a determined and fun-loving kid who is happiest when playing the drums, listening to old-school rock music, and interacting with people. Born as a micro preemie, a severe brain bleed caused Bryce to develop cerebral palsy. Despite the obstacles this presents, Bryce still enjoys sports, video games, friends, and having a good time like any other kid. Not much can change Aiden’s awesome smile and outgoing personality. Born eight weeks premature, Aiden has had over 26 surgeries to help correct his severe cerebral palsy, heart condition, Chiari malformation, Syringomyelia, and missing corpus callosum in his brain. Even with a list of challenges Aiden loves books, the outdoors, Spongebob, and communicating with his mom and sister through sign language. Be sure to watch out, This snuggler is sure to steal your heart! Claire and Elena are very happy toddlers that love to laugh and play. They were born 5 1/2 weeks premature and started life in an isolette. Now, Claire is adventurous and loves to be on the move and explore her surroundings. Elena enjoys holding her dog's leash from the stroller on their morning walk. They make friends no matter where they go, and they especially love giggling and playing with each other. Otherwise known as Action Jackson, this kid loves Sonic the Hedgehog, the color green, & playing on his Kindle. Jackson has Hemimegalencephaly (HME), causing him to only have half a functioning brain. He is learning to compensate after many hours on intensive therapy, allowing him to learn how to do things in a different way, including being a pretty great PS3 player with only one hand! Declan is an awesome kid with an amazing vocabulary that will blow you away. His happy and positive attitude is sure to win you over as well. He is an aspiring wheelchair basketball player who loves cartoons, Star Wars, and riding his adaptive bike made especially for the challenges he faces with his spastic diplegic cerebral palsy. Dylan is a spirited kid who can be found energetically running around, stealing cell phones to take the most adorable accidental selfies, and talking endlessly. Dylan undergoes daily therapies to manage his cystic fibrosis, but that doesn’t stop him from being a happy, lovable kid. Frannie, or Francesca, is a fun loving girl who loves the color orange and being outside! Frannie not only loves the outdoors but she especially loves to swim! One of her other favorite things to do is listen to music and attend music therapy! Also like many other teenagers, she spends most Saturday mornings hanging out and watching Disney Channel. Better known as C-Rae, this bright girl lights up a room with her blonde hair and big smile. Born premature and diagnosed with cerebral palsy, she has a hearing impairment and uses a wheelchair, but she’s never let her challenges get her down! C-Rae loves swimming, riding her bike, and especially being around people. Grayden welcomes everyone he sees and doesn’t know a stranger because everyone is his friend! He is the third of four children and loves spending time with his brothers and sisters. At around the age of two years old Grayden had a kidney transplant due to kidney failure, it’s name is George. In his free time he loves Legos, superheroes, and playing on his iPad. Energetic and cheerful, Lizzy is a joy to be around. She loves kitties, dance lessons, and helping out on the family farm. She’s even shown her own calf! Despite the challenges it brings, Lizzy never lets her cystic fibrosis stand in the way of enjoying her active life. Twin to Suzi, perhaps Layla was born nine weeks early because she couldn’t wait to figure out this great big world. Layla overcame the challenges of being a premie to become an adorable and curious kid who loves princesses, dress up, & playing with her siblings. Twin to Layla, Suzi is the talkative twin. She’ll ramble on with made-up toddler words until you’re overcome by the cuteness. The challenges of being born nine weeks early have lingered a little more with Suzi, making her more prone to digestive and ear issues. Suzi is a happy girl who loves princesses, baby dolls, and puppies. Older brother to twins Layla and Suzi, Will is a smiley and enthusiastic little boy. He has what’s called partial agenesis of the corpus callosum, meaning about 1/3 of the corpus callosum portion of his brain did not develop. This causes him to have developmental delays, but he’s now walking and talking! Will loves playing ball, drawing, singing, and going for walks with his sisters. Like any sassy seven-year-old, Carli loves playing games and being social, but she does it in her own unique way. Her cerebral palsy keeps her in her wheelchair and limits her sight and speech, but she can use a communication device to talk and even play Go Fish! Carli loves baseball, dolphin therapy, and getting to be with her older and younger brothers. Margaret is one spunky girl that doesn't let anything get in her way. Having been in a car accident that left her paralyzed from the neck down, Margaret doesn’t let this stop her from cheerleading, ice skating, and enjoying her new therapy garden designed by her big brother! Margaret also loves bling and has an awesome collection of key chains that she keeps on her wheelchair! Imaginative and kind, Connor is kid who just likes to have fun! Because of his osteogenesis imperfecta (better known as brittle bone disease), he uses a wheelchair to get around and has to be more careful than most kids. Connor embraces the good things about life, and loves technology, books, trains, and talking to people. Maria loves listening to all music and dancing along, but she is especially fond of Bruno Mars. She faces challenges each day from a stroke before she was born, hydrocephalus, and cerebral palsy. Maria loves life and is a joy to be around. Born with a rare genetic disorder that causes some delays, the need for transfusions, and mobility problems Dominic is an ornery little guy who loves Paw Patrol, his older and younger brothers, and just having fun. Dominic is always happy and is excited for his mom to have his new baby sister! Collin is a music-loving, carousel-riding friendly boy. He is diagnosed with Spina Bifida, Hydrocephalus, and Tetrasomy 18p, a rare genetic duplication that is only know to effect approximately 250-300 people worldwide. In the summer, you can catch this dude swimming and playing with friends! Shelbi is one smart cookie. She is a straight A student and she is learning to program robots right now. She loves to sing, dance, and play baseball. Shelbi doesn’t have an exact diagnosis, her doctors haven’t been able to crack her code. She does use a gait trainer to assist her, but that doesn't stop her from her several activities! As our miracle in the sky, Tommy is lovingly remembered as a happy boy who loved the Cardinals, the song “Happy”, and being with his family. He fought everyday to overcome challenges associated with a translocation chromosome disorder, cerebral palsy, and seizure disorder, but we know he is always dancing in the sky.